Domestic stocks lost ground last week as trade war concerns continued to rattle investors. With these declines, the Dow officially moved back into correction territory. For the week, the S&P 500 lost 1.43%, the Dow dipped 0.95%, and the NASDAQ dropped 2.11%. International stocks in the MSCI EAFE managed a 0.38% increase. An escalating trade dispute between the U.S. and China wasn't the only headline to affect markets. Last week also brought surprising data from the Labor Department. In March, the economy added 103,000 new jobs - far lower than economists anticipated. Meanwhile, wages grew, and unemployment remained a low 4.1%. We are now 1 week into the 2nd quarter of 2018. As we examine what may lie ahead in the markets, we will also focus on understanding what has happened so far this year. Here are a few key findings from the 1st quarter. In 2017, domestic markets experienced little volatility and significant gains. The 1st quarter of 2018, however, did not continue these trends. The CBOE Volatility Index (VIX), a popular measure of volatility, increased by 81% in Q1, as stock performance fluctuated. Between January and March, the S&P 500 had 23 days when it lost or gained 1%. In 2017's last quarter, the index didn't have a single day where it fluctuated that much. While the return of volatility may feel jarring, it is actually normal. Last year's calm is what is unusual. Major domestic indexes hit new records in January then slipped into corrections the next month. 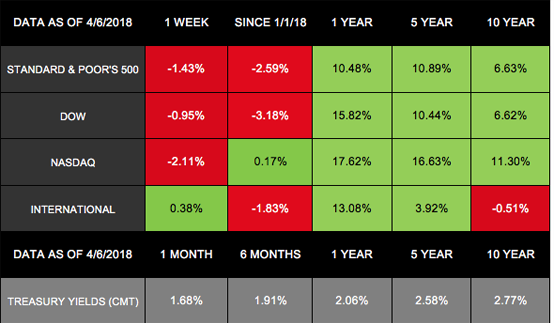 By March's end, they recovered somewhat from February's lows, but the S&P 500 and Dow still posted their 1st quarterly losses in more than 2 years. The S&P 500 lost 1.2% and the Dow dropped 2.3%. The NASDAQ ended in positive territory, with a 2.3% gain for the quarter. Despite market volatility and lackluster quarterly performance, the economy appears to be on solid ground. When announcing March's interest rate increase, the Federal Reserve beefed up the economy's growth projections and expressed that "the economic outlook has strengthened in recent months." In 2018, the Fed expects unemployment to fall to 3.8% and the economy to grow by 2.7%. In the coming weeks, we will receive more data that reveals our Q1 economic performance. We will also work to find answers to important questions for the 2nd quarter, such as: What will happen with trade and tariffs? Will the labor market continue to strengthen? In the meantime, if you have questions of your own, we are always here to talk.